We’ve all thought that way! Cal Newport is a Georgetown University computer science professor and author who studies the intersection of technology and society. His Deep Work: Rules for Focused Success in a Distracted World has actually changed the way I work at a fundamental level. He gives us hope that we can still do those things we know in our hearts we’re capable of, but we can’t get to them because of all the distractions that get in our way. Cal’s a leader of the social media reform movement, which is all about stopping the assumption that we have to be a big part of the social media scene. He doesn’t suggest we abandon it altogether. A lot of us enjoy social media. And most of us need to be connected at some level for our work. But we also allow it and plenty of other distractions to overwhelm us–and we are often regretful we “give in.” Why? Because we don’t get to work on the projects that really speak to us. As a consequence, we don’t get to be our best selves. 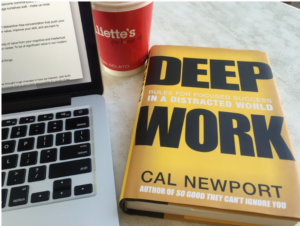 Newport’s book is so compelling, I’m going to reconsider every aspect of my efforts online and see what needs to go and what needs to stay in order for me to do more deep work. Of course, as a writer, I do deep work already. I have to so that I can create a book. But we all need (and want) to work deeply, whatever field we’re in. We need the time and space to explore our potential. 1) Deep work helps you quickly learn hard things, and in this economy, that’s a real advantage. Would you rather be known as the email queen–or the person in the office who produced the most exciting project of the year? Serious, intense, isolated study is what got people like Bill Gates to the top of his game. When he first started, he literally would fall asleep over his keyboard and wake up an hour later to finish writing code. If you can master the art of ignoring distractions, you have a clear advantage professionally. Because most of us can’t! That’s the plain and simple truth. It takes a while to train your brain to do deep work, but it’s worth it. 2) The trendy open-office concept isn’t as great as you think. Connectivity is important with your colleagues, but just as important is time alone to do deep work without distractions. In fact, Cal Newton says that’s more important for your success. He talks about the “spoke-and-hub” office environment that’s most conducive to success: you meet in the hub to exchange ideas with your colleagues, and then you retreat to your “spoke.” He also discusses whether it’s possible to do collaborative deep work, and of course, it is. But success there is not as common as you’d think. 3) Don’t fall into the “any-benefit” mentality: just because you might be getting one or two benefits from using a certain kind of social media doesn’t mean it’s advantageous for you to be active there. Get over FOMO (fear of missing out). Okey doke, if you’re trying to pare down your distractions, give this eye-opening, blunt book a read. Buckle your seatbelts! 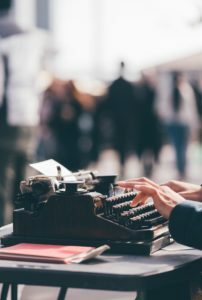 A lot of assumptions you have about how you’re already working your schedule in the most efficient way possible so you can do deep work might go out the window. There’s a better way to achieve success, Cal Newton promises us. There’s a better way to live a fulfilled, happy life–and it’s by using deep work to get you there.